Had many good eats for the past few weeks but there’s simply no time to blog! The menu claimed it was grilled fish for the day but I can’t see how it can be grilled when there is a light batter covering the fish. 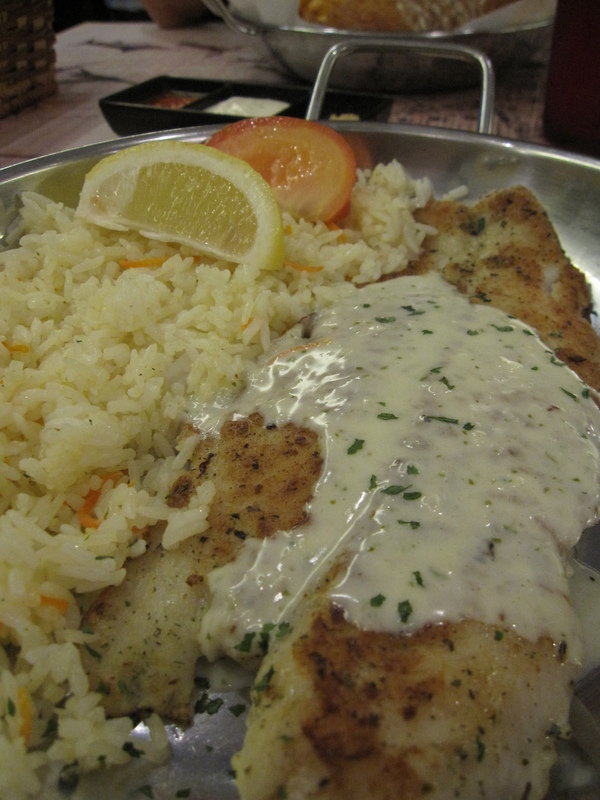 Nonetheless, the dory fillet was fresh with a subtle sweetness to it plus it was not overcooked (come to think of it i have never eaten dory that was overcooked) leaving the meat pleasantly moist. The carbs were simple enough, buttered thai rice with grated carrot- nothing spectacular like the pilaf rice I had in the US. The fish was surprisingly excellent leaving the friend quite impressed. 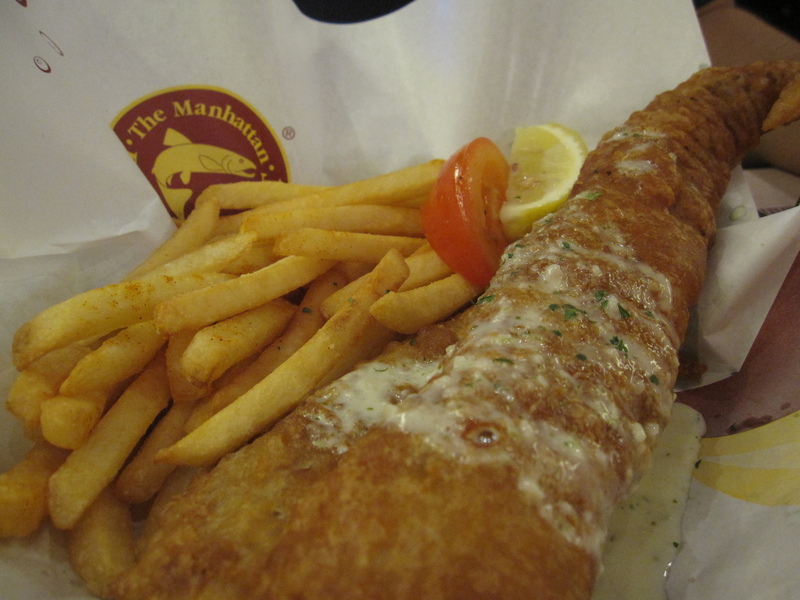 Well battered fish which executed a delectable crunch with every bite, definitely a must-try here. Dipping it into the chicken rice chilli sauce provided is really the Singaporean style, something you will never get in the US! You can choose between a few fishes for the fillet and my friend chose Alaskan Pollock, a white fish which seemed to be a little oiler, but perfect for this as it retained a nice moist texture inside the crispy outer layer that was thankfully, totally devoid of oil residue. The total bill amounted to about 25++ if I am not mistaken. 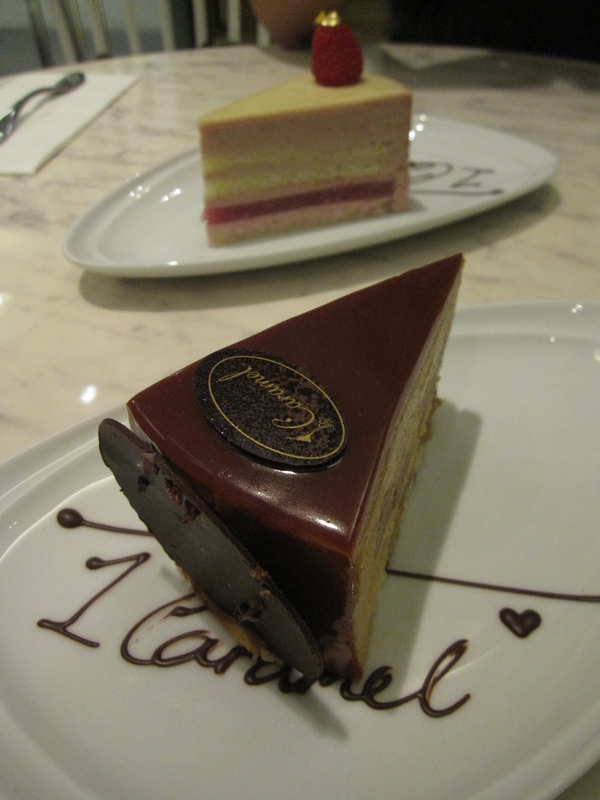 For desserts we headed down to 1 Caramel, not a far walk away from Plaza Singapura. 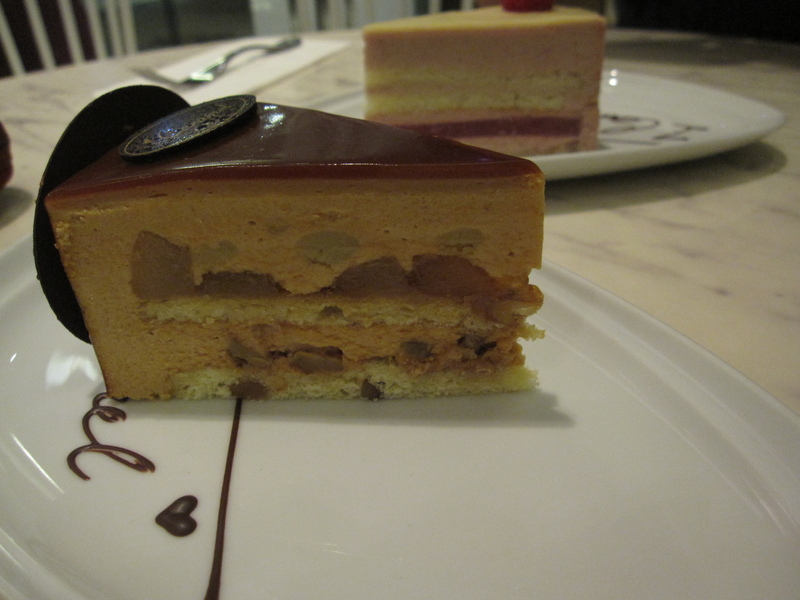 My choice was 160 degrees, a truly decadent cake with caramel as the main star of the show. The salty caramel mousse was wonderfully sweet but this was offset by the slight saltiness of the sea salt. The 2 layers of dacquoise were substantial enough to satisfy a reasonablee cake to mousse ratio and the candied walnuts were the bomb 😀 And how can I forget the caramelised pear chunks? Heaven! The uppermost layer or caramel was sickly sweet but that’s how caramel anyway. I could have done without the caramel glaze because the mousse itself (not too jelly-like, gelatin was evidently added but it was nowhere excessive) paired extremely well with everything else. The lychee rose was unfortunately a disappointment. I suppose the bottommost layer of cake was soaked in some sort of flavoured syrup that I could not discern. What was most surprising was the mousse which had such a mild rose flavour that I seriously wondered what sort of rosewater they used. The valrhone iviore white chocolate glaze tasted stale, leaving me disgusted at the standards of such a reputed institution for chocolate. 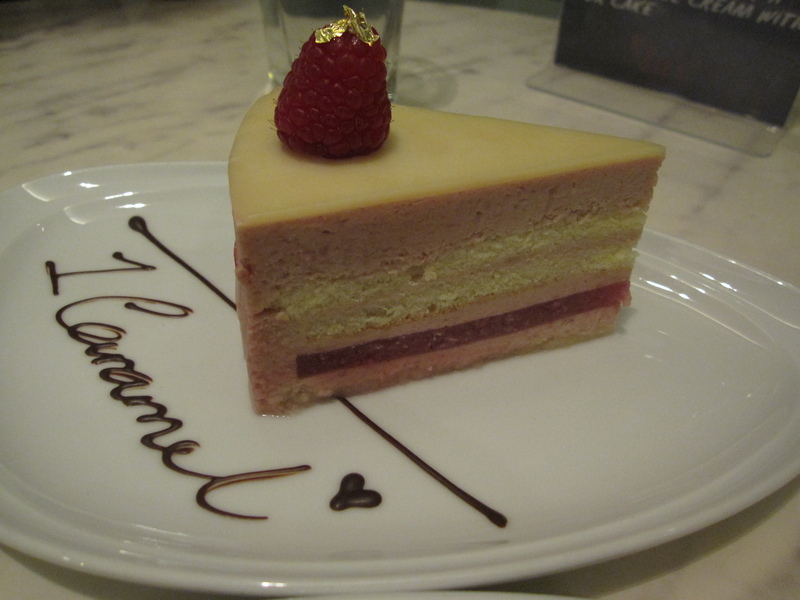 Perhaps the only saving grace was the lychee gelee (tasted mroe like raspberry to me but who cares :P) which provided a textural contrast to the other components of the cake. In short the cake just failed to deliver because of the lack of flavour that I expected from such a classic ispahan combition. Total bill was $18.60 after GST. Each piece cost $7.90.